resume of his research and practice-based film ‘Thesis‘. Thesis is a fascinating film that reconstructs and reinterprets the Apollo 11 lunar mission across 6 chapters, all of which happen in real time. The 2-hour film is engaging and captivating, using original scientific footage and audio recorded by the astronauts and mission control with the flight directors whilst in progress. It is a meticulous reconstruction of the events as they happened, through a multi-picture format with sync audio layers representing one of the most profound historic, scientific and anthropological events in mankind’s evolving journey. On its most immediate level the film is about exploration of the unknown when we set out on a journey to somewhere completely different from our previous experiences of the world. The film frames each of the chapters with a metaphorical title which represent a particular conception of life experience from Birth (as a metaphor for the launch) to Reverberation (the end of a journey with its reflection and reflexivity). 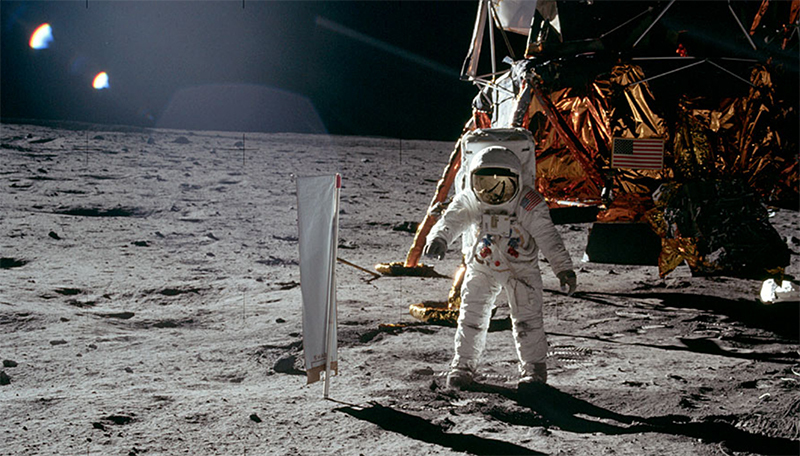 The film engages you through the intense moments in the journey, heightened through sound design and music, including walking on the moon surface where the astronauts undertake a number of ritualistic, scientific and seemingly staged promotional events, which become more abstracted and humorous over time. The film raises many inner dialogues which make you think on the amazingly abstract concept of our experience with technology, that going to the moon necessitates. This was a tough-provoking evening with many take-aways following the experience of the film. One being the wonder of the place we live in and the other how technology shapes the way we interpret and identify with the wonder of the place we live in for better and worse. The Screen Research Forum investigates new interventions in cinema and is organised by Professor William Raban. It plays host to a growing community of both film-based PhD based Academic research work. 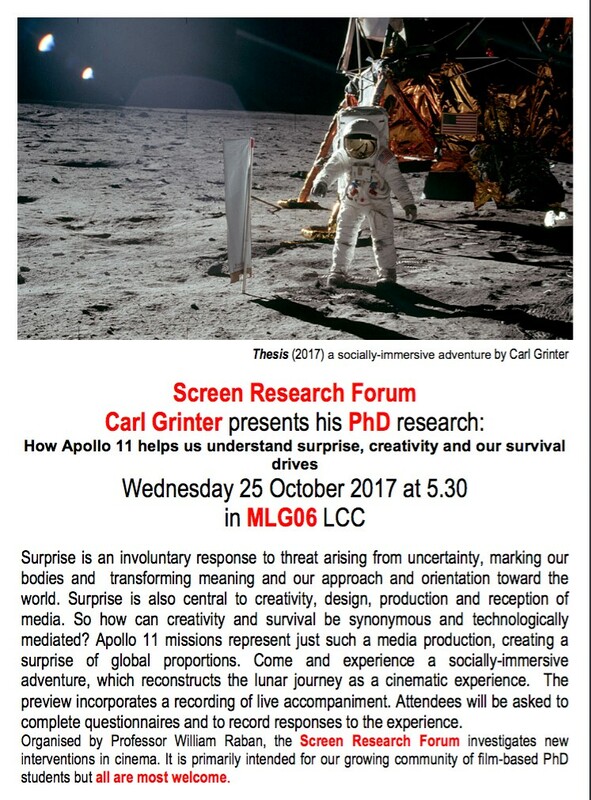 The screening of Grinter’s film took place on Wednesday 25th October 2017 but will be re-shown in the spring term. To be announced shortly. How surprise transforms anxiety to create meaning and value in the design, production and experiential consumption of social-immersive media? Social-immersive media, associated with virtual and mixed-reality responsive-media, enables us to participate through role-enactment in partly actual and partly fantastical experiences. This mentally- absorbing situation enables a process, change and passage from one mental state to another, characterised by diminishing critical distance and increasing emotional involvement (Grau,2002). Through practice, i am researching how immersive experience remediates the conditions within which surprise arises in real world conditions, generated as a consequence of anxieties when dealing with uncertain and unpredictable scenarios. As a reparative response surprise can provide valuable learning and new ways of seeing the world. Find out more about the commercial work Carl undertakes at www.3wm.tv .